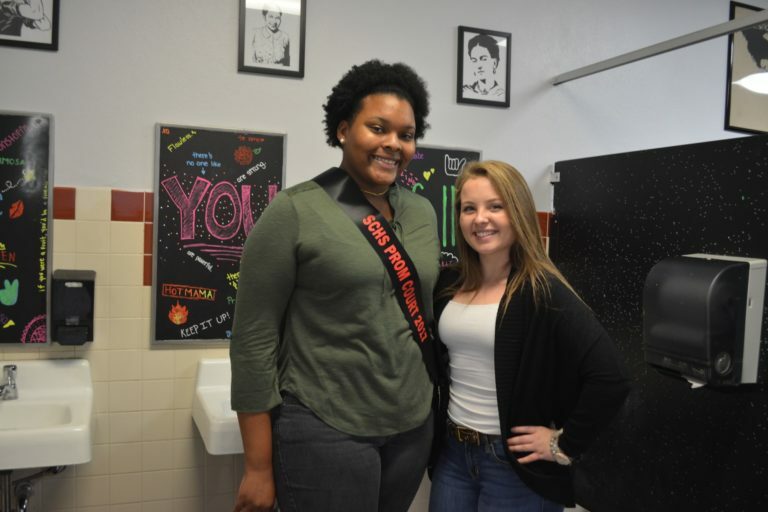 Following a similar initiative at a high school in California, students have revamped the bathrooms at Strawberry Crest High School. There was surprise, confusion and, not long after, lines outside of the girls’ bathrooms at Strawberry Crest High School Monday, April 17. Students had returned to school following a three-day weekend to find that four bathrooms throughout the school had been revamped and redecorated. But one thing was missing: mirrors. You are loved. You are smart. You are worth it. After SCHS Principal Dave Brown heard about the project, he approached Danielle Wynn, the founder of Crest’s Girls Learn International program at the school, and student government member Taylor Norrington to see if something similar could be done at Crest. The girls liked the idea so much, they upped the ante. The mirrors have been replaced with positive, supportive messages. “We thought it would have a big impact, we thought it would be helpful,” Wynn, a senior, said. Both Wynn and Norrington said that they had friends who often flocked to the bathroom between classes or during lunch to touch up their hair or makeup. Like Laguna Hills High, they removed the mirrors from all the bathrooms and replaced them with phrases meant to boost self-esteem. They got other students on board, too. After school on Thursday, April 13, the girls and 35 other students split up into teams to redecorate the restrooms. They let their creativity and tastes show: in one bathroom, pictures of maps and destinations decorate the wall. In another, a funky chandelier hangs above the sinks. On Monday, the rest of the female student body checked out the redone bathrooms. At the time, Norrington said, the reactions to removing the mirrors seemed to be about half for and half against. For junior Mackenzie Silas, the removal was a weight lifted off of her shoulders. According to a 2008 study by the Dove Self-Esteem Fund entitled ‘Real Girls, Real Pressure: A National Report on the State of Self-Esteem,’ 78% of girls with low self-esteem admitted that it is hard to feel good in school when they don’t feel good about how they look. The survey was conducted online among 1,029 girls between the ages of 8 and 17 throughout the United States. Of those surveyed, 62% reported feeling insecure, and 75% with low self-esteem reported engaging in negative activities due to their insecurities, including eating disorders, drinking, smoking and self-harm. With revamped bathrooms, Brown and his student leaders are hoping to change those statistics.